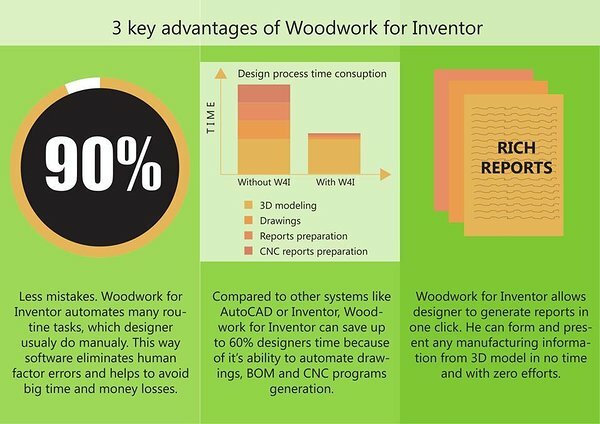 Woodwork for Inventor is an add-on for the Autodesk Inventor mechanical design software which turns this software into a work environment for computer-aided design of furniture and other wooden products. This furniture design software package enables constructors to work more efficiently and accurately, with fewer errors, allowing them more time for creative work by automating routine tasks of digital information preparation required to start the manufacturing process. Woodwork for Inventor adds an extra feature to the Autodesk Inventor software which allows the user to easily and visually assign furniture materials (Solid wood, Board, Laminated board, Multilayer board, Rod, Desktop, Veneer/film, Edge banding, Paint) to parts using the data base which can be freely added to by the user. Woodwork for Inventor uses its own mortise cutting method which, unlike conventional systems, primarily allows you to quickly arrange hardware fittings in a model and to automatically cut required holes accordingly.